Commissioned by a client who had fallen out of love with her existing engagement ring, this redesign reinvents the trinity diamond ring with a confident and modern twist. With the help of the additional metal provided by her own wedding band, plus her mother in law’s yellow gold wedding band, we were able to accentuate the diamonds by setting it atop a dual coloured Saturnian band . 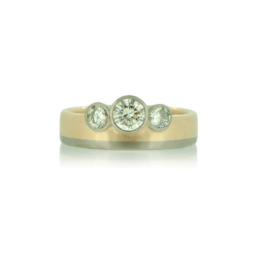 18k yellow and white gold with three modern cut colourless diamonds.